This week, I sent off my swap box for Oh Comely magazines Perfect Strangers project. For those of you unfamiliar with the idea, it involves matching up two readers - who can choose to be either connected with someone in their country or overseas - who send each other a box of gifts based on a brief submitted bio. I opted to swap a box with someone in a different country to me - just to keep it interesting! After a few weeks of signing up, I was paired with Julia - a freelance graphic designer and keen gardener from Portland, Oregon in the USA. I was immediately excited about compiling a box full of gardening treats. As someone who lives in Dorset, inspiration isn't hard to come by! I wanted to go for a quite a rustic look to keep with an outdoorsy theme, so picked up a cardboard box from Hobbycraft to fill with natural box filler for padding. I then got to work on a small postcard print, on which I painted a small floral wreath and bee. I love painting bees lately - don’t ask me why! Although I’m definitely no artist, I had fun painting this and was pleased with the outcome… I’ll just say I was going for the imperfect approach! 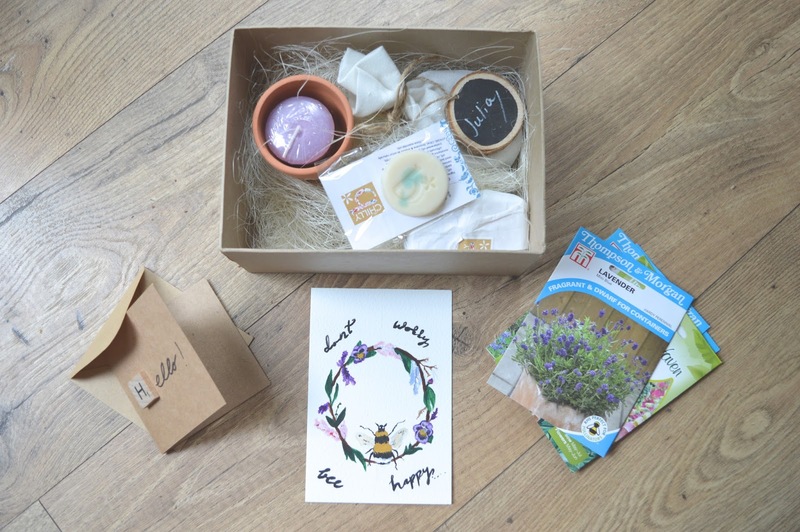 I then picked up a mixture of Dorset related seeds and - as lavender was one of my favourites - I included a small Yankee candle inside a mini terracotta pot - just for effect, which I thought looked cute. I also ordered a three stack soap sample pack from chillyB in Dorset, who make organic homemade soaps to order, in addition to a Holistix Gardener’s Balm that I spotted at the Vegan Fair (post here!) a few weeks back. I thought both would be ideal when seeking some post-gardening TLC! And - of course - I made a small card just to introduce myself and fill Julia in on her Dorset related goodies. I hope she liked them! I was immediately in love with everything! I’d included in my bio that I was a self confessed tea lover with a penchant for the written word, so my box was filled with stationary, stickers, cards, stamps and a bundle of different teas to try. I’m super excited to try the Pearl's Jasmine Tea - I’ve never tried them before. I loved the hand written letter from Julia, who seemed so lovely - I’ll definitely be sending her a letter in response, just to thank her for the beautiful gifts that summed me up perfectly. I can’t wait to use my personal “From The Desk of Lottie” cards - even though I don’t want to ruin them! The Perfect Strangers is such a lovely idea in a world thats so tech based. It bought back the excitement of sending letters (which I did on rare occasions as a young kid) and the fun of sending a parcel across the world. I’ll definitely be signing up again for next year!